Joseph Merrick (1862-1890) suffered from severe incurable deformities that eventually caused his death at 27 years old. For years he was exhibited to the world as a “freakshow” which led to his celebrity as the Elephant Man throughout Europe. In late 19th century London, “It was not uncommon to see curiosity shops showcasing individuals with various conditions and syndromes, displayed to shock horrify and warn the general public against a multitude of sins that caused such conditions. Such was the life of one Joseph Merrick” (De Souza). After suffering a great deal of abuse and exploitation at the hands of his managers, Merrick was rescued by Frederick Treves, an English surgeon who took an interest in his case. He was permitted to spend the remainder of his life resting at the London Hospital where sophisticated English society often paid him visits out of curiosity and sympathy. This fascination with Merrick stemmed from the tumors that covered the entirety of his body and the abnormal growth of his hands, legs, and lips. His asymmetrical limbs, his misshapen and overgrown head, and the appearance and color of his mutated body inspired his namesake. His monstrosity pertains to the idea of being human, albeit, a deformed one. There has always been a failure to categorize Merrick. 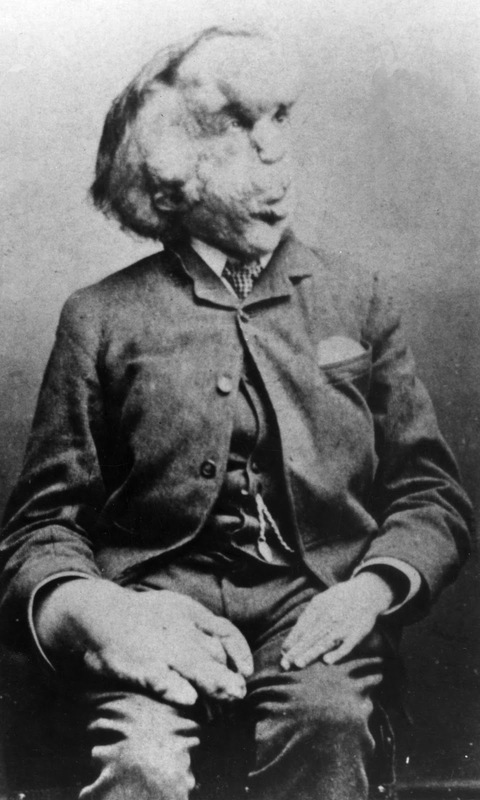 This inability to identify what the Elephant Man was in scientific or medical terms catalyzed his classification as a freak; he is monstrous because society was incapable of understanding what exactly he was. Sadly, it was Merrick’s desperation to be classified as normal that resulted in his death when he tried to sleep lying down like everyone else. He ordinarily slept in a sitting position to avoid potentially suffocating from his extremely overweight skull. To this day, Merrick’s diagnosis has remained inconclusive. Many believed he suffered from neurofibromatosis type I; however, modern day scientists proposed the congenital disorder known as Proteus Syndrome as the source of his deformities. Despite the fact that almost 200 years have passed since his death from asphyxiation, interest in him still persists. Joseph Merrick’s story was immortalized in Bernard Pomerance’s 1979 play called “The Elephant Man,” and David Lynch’s acclaimed film released in 1980 by the same name. 1. Baumgartner, Holly Lynn., and Roger Davis. Hosting the Monster. Amsterdam: Rodopi, 2008. Print. (2012): 123-24. EBSCO Mega File. Web. 3. Graham, Peter W., and Fritz Oehlschlaeger. Articulating the Elephant Man: Joseph Merrick and His Interpreters. Baltimore: Johns Hopkins UP, 1992. Print. 4. Montagu, Ashley, and Frederick Treves. The Elephant Man: A Study in Human Dignity. New York: E. P. Dutton, 1979. 5. Tibbles, J. A., and M. M. Cohen. “The Proteus Syndrome: The Elephant Man Diagnosed.” Bmj 293.6548 (1986): 683-85. I really like your post about the Elephant Man! It is a perfect example of how someone is an outcast due to physical deformities. Much of society is based on shallow, superficial traits, and the Elephant Man not only represents what is different, but also the social constructs of discrimination. Great post! You importantly point out that medicalization often functions as a normativizing force and because the Elephant Man could not be readily diagnosed (or categorized) he was cast off as a “freak.” His “fame” also brings up important questions regarding “freakery.” Is Merrick’s lasting influence a result of his infamy–do people still remain fascinated by his abject body? Or, is it that viewers of Lynch’s film are drawn to the figure of the Elephant Man more out of empathy than disdain?